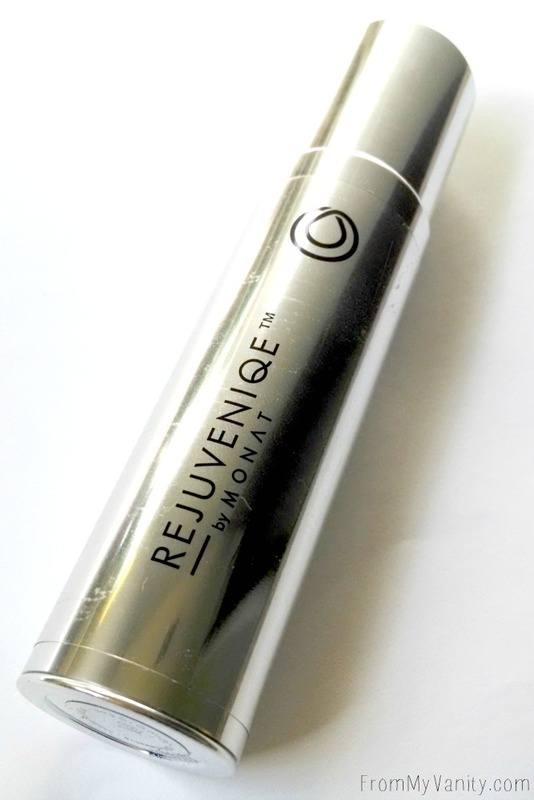 Rejuveniqe Oil Intensive’s exclusive key ingredient is Abyssinian Oil, which along with 10 other rare oils creates a unique molecular structured product that minic’s the body’s own natural oils to visibly replenish and repair with instant as well as long-term age prevention benefits for both hair and skin. Can be used alone as an all body moisturizer for superior hydration, and/or on specific problem areas such as cuticles, elbows, knees, rough patches. Or mix with facial and body products for an extra-added boost of deep penetrating hydration. Obviously, from the price, this intensive oil is definitely a luxury item (at least, in my book it is! 🙂 I was definitely intrigued to see how this oil would compare with the argan oil products that I typically use to help keep my hair healthy and combat the frizz. The bottle is really sleek and fancy-looking. While it looks like it would be made of glass or something, it’s actually plastic. The dropper inside doesn’t ever fill up all the way, which I thought was weird. But, so far, it seems to give out the perfect amount to apply throughout my hair. 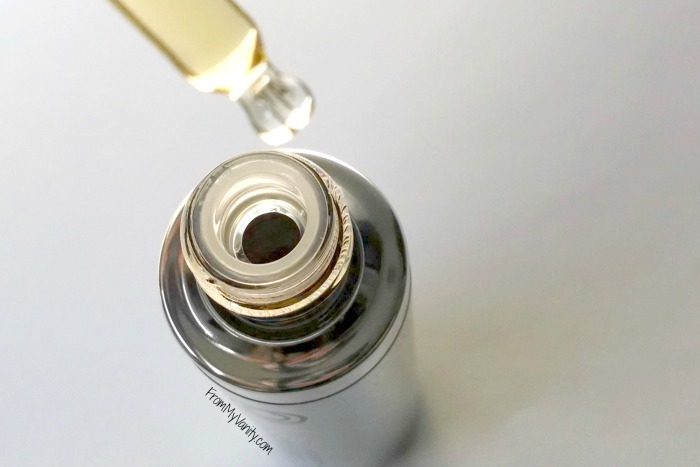 Rejuveniqe Oil Intensive is definitely different than other hair oils I’ve tried in the past. I’ve noticed that it’s easier to get an even application throughout my hair. I’ve applied it while my hair is wet and also dry — like when I finish styling my hair and just want to tame the frizz and add some shine. I like that this oil doesn’t make my hair look greasy — that’s an issue I can run into if I apply too much argan oil. The biggest like is that it does tame my frizz and gives my hair a healthy shine! I haven’t been able to use it long enough to test the long-term benefits of this oil, but so far it’s been really beneficial to my hair. The only dislike would be the price. It’s just very far out of my budget. I do think that this product will last a while, so it’s nice to know that your $99 will go pretty far before having to repurchase. They also sell it on Amazon, though the price is higher, for some reason. All in all, my final recommendation would be that if you can afford this hair product (and skin product, though I haven’t tried it for that), it definitely is very beneficial for your hair. The ingredients in this product is very unique from other hair products on the market today. And the fact that MONAT stays more natural is definitely a plus in my book! Question for My Readers: What is your biggest concern when it comes to your hair? Have you been able to find a product that helps repair that concern? Share it with me in the comments below! I received one or more of the products mentioned above from iFabbo in the hopes that I would mention them on my blog. Regardless, this does not guarantee a review or feature on my blog. I only share information that I think will be useful for my readers and I only recommend products I have personally used. It’s Friday, and you know what that means, right? Hairstyling with NuMe – Twisted Half-Updo! Hairstling with NuMe – Waterfall Braid! Everything about the Nume Titan3 curling wand just screams professionalism and high quality. The feel of the base is really neat — it’s almost soft… It’s really hard to describe! But it’s certainly not the usual finish and feel of a curling wand. It feels very luxurious. 🙂 The barrels are well made and, because they’re made with titanium, they’re really light. And I mean really light! Which is wonderful, as my arms easily and quickly tire out when holding a heavy item above my head for any length of time. The cord is really thick and feels really strong and sturdy. The barrel of this wand is able to rotate all the way around, which is really nice when I’m using it — I never have to worry about the cord getting all twisted up on itself (which is often the problem I have with my regular curling iron). I’ve used it several times and have noticed the fact that I don’t have to sit and untwist the cord halfway through my curling, like I usually have to do. Definitely a plus, in my book! Once you know which of the three barrel you want to use, all you have to do is line up the holes and snap the barrel into place. It’s pretty easy and very quick to do. Then you turn it on, select your temperature setting, and give it about 10 or so seconds to heat up. That is seriously all it takes to heat up! I love that this can get hot so quickly. I can be pretty impatient at times, and too often I forget to plug in my curling iron ahead of time and then I end up waiting on the barrel to heat up before I can start. But with NuMe’s Titan3 Curling Wand, I can start curling almost the moment after turning it on. It’s wonderful! It takes a little while to cool down, but when I compared it to my regular curling iron that I own, the Titan3 does cool down more quickly. Pretty sweet! One particular day I curled my hair with both the smallest and medium sized curling wands (to give a variety of curl sizes) and it actually wasn’t too bad, switching between wands. I had to give it a minute or two to cool down, but during this time I was able to section off the next part, so it wasn’t time wasted. And since I had the glove that NuMe includes with all their curling wands, I was actually able to get a pretty good hold on the wands when I went to take it off, even though it was still slightly warm. When I go to take a barrel off of the base, I often have a few moments of struggle as I try to click the two buttons on either side of the base and pull on the barrel. I’m not sure why I have so much trouble (maybe I need to work out? lol! ), but it often takes me several tries to get both buttons pressed down sufficiently at the same time in order to be able to pull the barrel off of the base. I’ve watched several YouTuber’s use this set and haven’t seen them have trouble, so I don’t know if I’m just really weak, or this is a flux in this particular wand. But I just wanted you to be mindful of this fact — it really isn’t too big a deal, since I can just get one of my brothers or my dad to help pull it apart, if I needed to (though I haven’t yet. I’ve been able to pull them apart on my own, after a few tries). A lot of things! I love the feel of the wand. It’s so smooth, almost velvety, feeling. It makes me feel really professional and like I am pampering my hair when I use it. 🙂 I’ve also noticed my hair looks shiner once I finish curling (often, after using a normal curling iron, my hair looks dull and dry), so that’s an awesome plus to this wand that I really appreciate! The fact that it heats up fast is a wonderful bonus! I’ve already explained my reason why I love this aspect of it, so I won’t repeat myself. 🙂 Another thing that I like about this set is that it’s so incredibly light — lighter than any other curling wand or iron I’ve tried before in the past. My arm still can get tired from holding it above my head, but it would get tired even if I was holding nothing, right. But the fact that it doesn’t start hurting right away (like it would before) is really nice. Saves my arms that awful ache! I really love my NuMe Titan3 curling wand set! Ever since I got this in, I don’t reach for anything else when I go to curl my hair. Even if I just want a bit of wave to my hair, all I have to do is grab the largest barrel and in a few minutes — bam! I have waves! It’s so easy and I love the versatility of this wand being interchangeable. It’s so nice not to have to have 3 different curling irons sitting around my room taking up space and getting their cords all tangled up together. The Titan3 is able to be broken down to shorter sections that are really easy to slip into a drawer and be put out of sight. If you’ve been on the lookout for a good curling wand set or just need a new set to replace your old ones, I would highly recommend you getting the Titan3 set! Or if you want more variety with your curls, the NuMe Lustrum curling set comes with 5 different wands, making the possibilities almost endless! NuMe’s heat tools are an investment, but totally worth the money you put into it! And these tools will last you a long time if you take care of them. And — above all — it helps your hair stay healthier! Which, when you think about it, is a priceless quality to these tools. I received this curling wand set from NuMe in order to review. It was not required that I give a positive review, but solely to express my own thoughts and opinions of this product, which I have done. I only recommend products and/or services that I have personally used or experienced and like. Question to My Readers: Are you on the lookout for a new curling iron? Are you the type to invest in good-quality tools?